5900 Bluestem Circle, Greensboro, NC 27405 - $126,900 | Under Contract In Under 2 Months! The seller of this beautiful property has priced it right and offering $2,000 in closing costs as well as the refrigerator & TV in the sunroom with acceptable offer! Reedy Fork offers tons of amenities for the $$$. The community has tennis courts, pools, playground areas, community center, beautiful walking trails and its own elementary school - Reedy Fork Elementary. 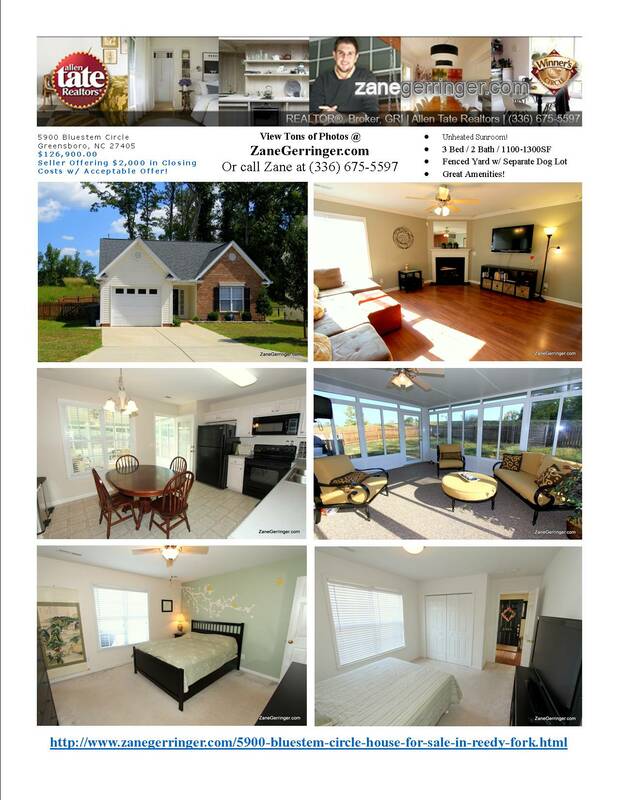 Come see 5900 Bluestem Circle today - By appointment only - call your Realtor or Zane at 336-675-5597 today! For the techies - the living room is wired with 5.1 Surround sound with cable and 2 HDMI connections! Want More Info On 5900 Bluestem Circle? 5900 Bluestem Circle is marketed by Zane Gerringer of Allen Tate Realtors in Greensboro, NC.